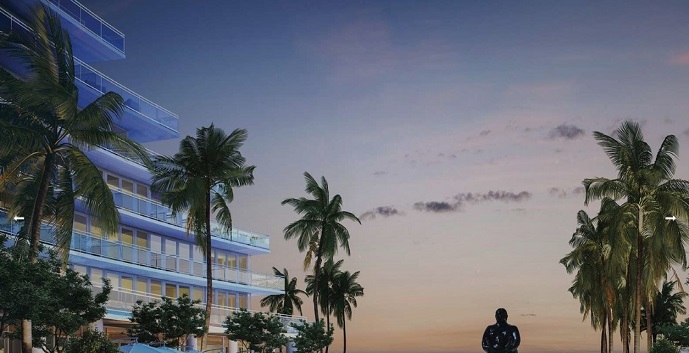 Auberge Beach Residences and Spa Is an award winning property situated directly on Fort Lauderdale beach with 450 feet of private beach. 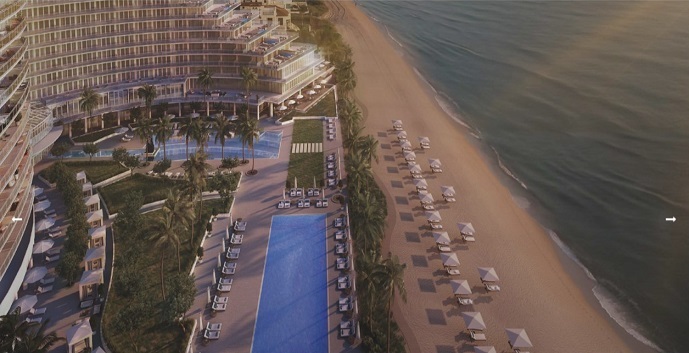 The Aburge Beach Residences and Spa Fort Lauderdale is the newest addition to the Auberge Collection of exceptional properties. World class amenities include personalized concierge service, 24/7 valet parking and security, private beach club with butler services, multiple swimming pools with cabanas, world class restaurants and spa, wine tasting salon featuring Auberge’s Best Napa Valley Selections, Cigar Lounge, State of the Art Fitness Center, Club Room including multimedia, billiards, and gaming tables and Children’s Room and Teens’ Entertainment Room, Library and Private Business Center. 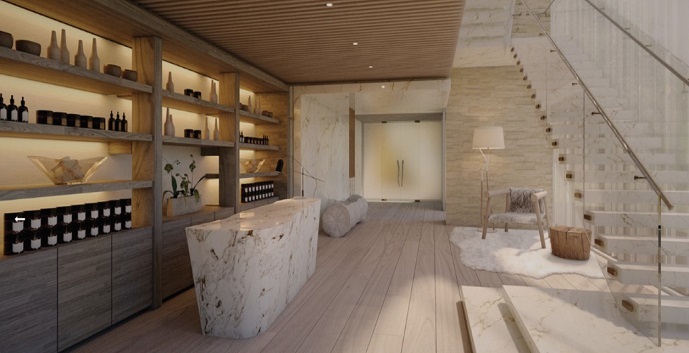 The Auberge signature spa will cater to resident’s health and wellness with holistic treatments and signature therapies. 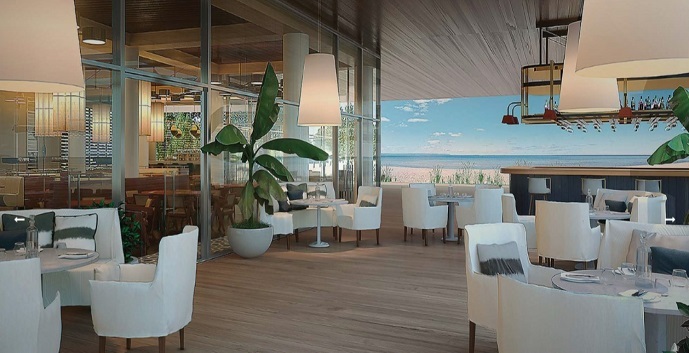 The Auberge will feature unique dining experiences created by highly skilled chefs with indoor and outdoor beachfront seating for a casual elegant ambience. 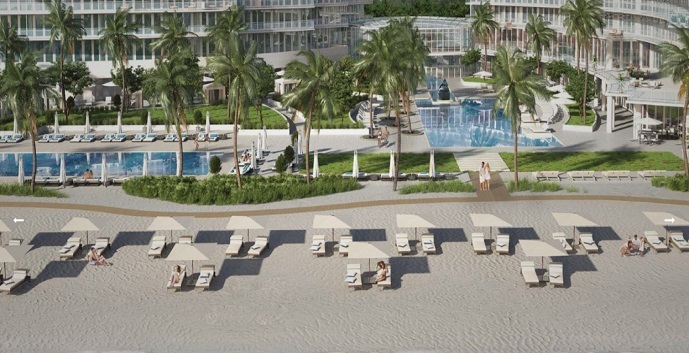 Capturing the essence of beachfront living, the Auberge has been designed with one of the finest contemporary pools with poolside cabanas and comfortable chaise lounges on its private beach front sand. 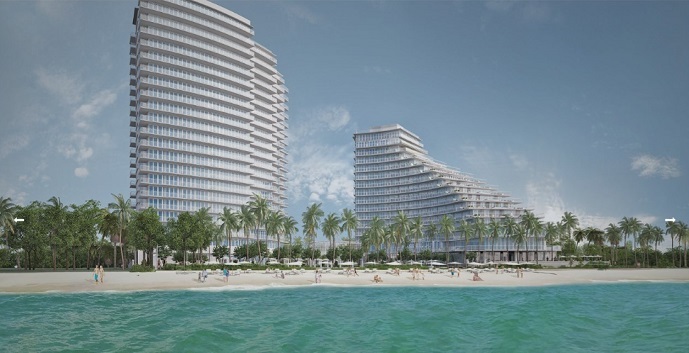 The Auberge Beach Residences offers a North Tower and South Tower. 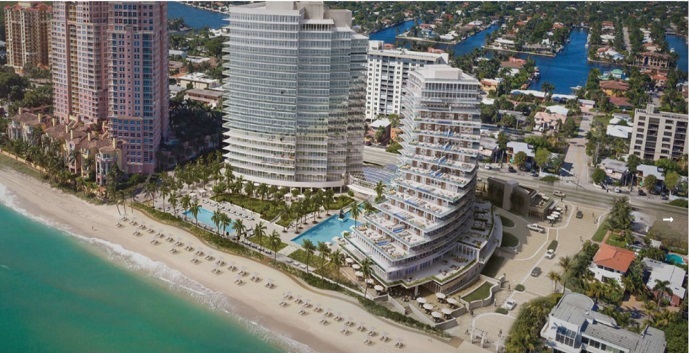 The North Tower is a 17 story condominium tower with 53 condos and 4 penthouses to chose from. 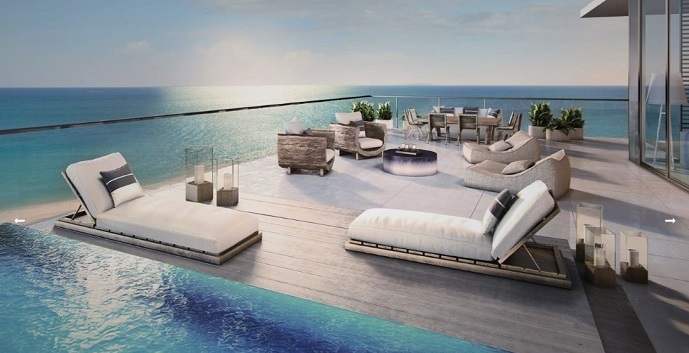 The South Tower is a 24 story condominium tower with 27 condos and 10 penthouses to chose from. Unit 0201 Model G1 - 2 bedrooms, 2 and 1/2 bathrooms. 1,990 interior sq.ft., 305 exterior sq.ft., 2,295 total sq.ft. 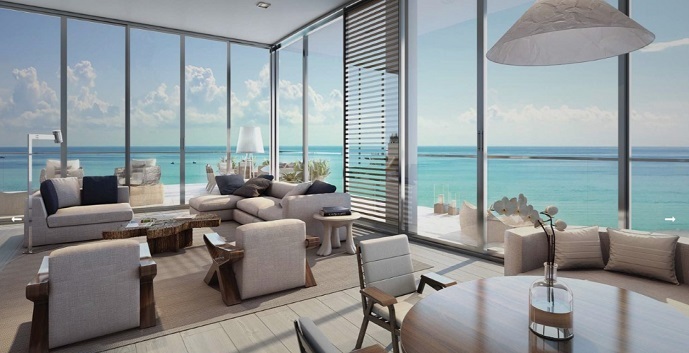 Unit 0202 Model H - 1 bedroom, 1 and 1/2 bathrooms, 1,627 interior sq.ft., 268 exterior sq.ft., 1,895 total sq.ft. Unit 0203 Model G-2 - 2 bedrooms, 2 and 1/2 bathrooms and den. 1,994 interior sq.ft., 399 exterior sq.ft., 2,393 total sq.ft. Unit 0204 Model F-1 - 3 bedrooms, 4 and 1/2 bathrooms, maids room and den. 3,455 interior sq.ft., 3,117 exterior sq.ft., 6,572 total sq.ft. Unit 0205 Model E-1 - 3 bedrooms, 4 and 1/2 bathrooms, maids room and den. 3,751 interior sq.ft. 3,651 exterior sq.ft., 7,402 total sq.ft. Unit 0206 Model J - 3 bedrooms, 3 and 1/2 bathrooms. 2,149 interior sq.ft., 470 exterior sq.ft., 2,619 total sq.ft. Unit 0207 Model I-1 - 2 bedrooms, 3 bathrooms and den. 1,802 interior sq.ft., 438 exterior sq.ft., 2,240 total sq.ft. Unit 0208 Model I - 2 bedrooms, 3 bathrooms and den. 1,824 interior sq.ft., 444 exterior sq.ft., 2,268 total sq.ft. Unit 0301 Model A-1 - 4 bedrooms, 6 bathrooms, home office and den. 3,422 interior sq.ft., 1,489 exterior sq.ft., 4,911 total sq.ft. Unit 0302 Model B-1 - 3 bedrooms, 3 and 1/2 bathrooms. 2,703 interior sq.ft., 1,690 exterior sq.ft., 4,393 total sq.ft. Unit 0304 Model D-1 - 2 bedrooms, 3 bathrooms and den. 1,895 interior sq.ft., 3,225 exterior sq.ft., 5,120 total sq.ft. Unit 0305 Model F - 3 bedrooms, 4 and 1/2 bathrooms, maids room and den. 3,539 interior sq.ft., 1,440 exterior sq.ft., 4,979 total sq.ft. Unit 0306 Model E - 4 bedrooms, 5 and 1/2 bathrooms, maids room and den. 3,994 interior sq.ft., 2,103 exterior sq.ft., 6.097 total sq.ft. Unit 0401 Model A - 4 bedrooms, 6 bathrooms, home office and den. 3,422 interior sq.ft., 1,108 exterior sq.ft., 4,440 total sq.ft. Unit 0402 Model B - 3 bedrooms, 3 and 1/2 bathrooms. 2,703 interior sq.ft., 726 exterior sq.ft., 3,429 total sq.ft. Unit 0403 Model C - 2 bedrooms, 2 and 1/2 bathrooms. 1,870 interior sq.ft., 378 exterior sq.ft., 2,248 total sq.ft. Unit 0404 Model D - 2 bedrooms, 3 bathrooms and den. 1,895 interior sq.ft., 690 exterior sq.ft., 2,585 total sq.ft. Unit 0405 Model L - 3 bedrooms, 3 and 1/2 bathrooms. 2,959 interior sq.ft., 1,453 exterior sq.ft., 4,412 total sq.ft. Unit 0406 Model K - 4 bedrooms, 4 and 1/2 bathrooms. 3,308 interior sq.ft., 1,811 exterior sq.ft., 5,119 total sq.ft. Unit 0501 Model A - 4 bedrooms, 6 bathrooms, home office and den. 3,422 interior sq.ft., 1,018 exterior sq.ft., 4,440 total sq.ft. Unit 0502 Model B - 3 bedrooms, 3 and 1/2 bathrooms. 2,703 interior sq.ft., 726 exterior sq.ft., 3,429 total sq.ft. Unit 0503 Model C - 2 bedrooms, 2 and 1/2 bathrooms. 1,870 interior sq.ft., 378 exterior sq.ft., 2,248 total sq.ft. Unit 0504 Model D - 2 bedrooms, 3 bathrooms and den. 1,895 interior sq.ft., 690 exterior sq.ft., 2,585 total sq.ft. Unit 0505 Model N - 3 bedrooms, 3 and 1/2 bathrooms. 2,434 interior sq.ft., 1,344 exterior sq.ft., 3,778 total sq.ft. Unit 0505 Model M - 3 bedrooms, 3 and 1/2 bathrooms. 2,674 interior sq.ft., 1,655 exterior sq.ft., 4,329 total sq.ft. Unit 0601 Model A - 4 bedrooms, 6 bathrooms, home office and den. 3.422 interior sq.ft., 1,018 exterior sq.ft., 4,440 total sq.ft. Unit 0602 Model B - 3 bedrooms, 3 and 1/2 bathrooms. 2,703 interior sq.ft., 726 exterior sq.ft., 3,429 total sq.ft. Unit 0603 Model C - 2 bedrooms, 2 and 1/2 bathrooms. 1,870 interior sq.ft., 378 exterior sq.ft., 2,248 total sq.ft. Unit 0604 Model D - 2 bedrooms, 3 bathrooms and den. 1,895 interior sq.ft., 690 exterior sq.ft., 2,585 total sq.ft. Unit 0605 Model O - 4 bedrooms, 5 and 1/2 bathrooms and home office. 3,752 interior sq.ft., 2,688 interior sq.ft., 6,440 total sq.ft. Unit 0701 Model A - 4 bedrooms, 6 bathrooms, home office and den. 3,422 interior sq.ft., 1,108 exterior sq.ft., 4,440 total sq.ft. Unit 0702 Model B - 3 bedrooms, 3 and 1/2 bathrooms. 2,703 interior sq.ft., 726 exterior sq.ft., 3,429 total sq.ft. Unit 0703 Model C - 2 bedrooms, 2 and 1/2 bathrooms. 1,870 interior sq.ft., 378 exterior sq.ft., 2,248 total sq.ft. Unit 0704 Model D - 2 bedrooms, 3 bathrooms and den. 1,895 interior sq.ft., 690 exterior sq.ft., 2,585 total sq.ft. Unit 0705 Model P - 3 bedrooms, 3 and 1/2 bathrooms. 2,464 interior sq.ft., 2,384 exterior sq.ft., 4,848 total sq.ft. Unit 0801 Model A - 4 bedrooms, 6 bathrooms, home office and den. 3,422 interior sq.ft., 1,018 exterior sq.ft., 4,440 total sq.ft. Unit 0802 Model B - 3 bedrooms, 3 and 1/2 bathrooms. 2,703 interior sq.ft., 726 exterior sq.ft., 3,429 total sq.ft. Unit 803 Model C-2 - 3 bedrooms, 3 and 1/2 bathrooms. 2,800 interior sq.ft., 1,316 exterior sq.ft., 4,116 total sq.ft. Unit 0804 Model D-2 - 3 bedrooms, 3 and 1/2 bathrooms. 2,508 interior sq.ft., 1,753 exterior sq.ft., 4,261 total sq.ft. Unit 0901 Model A - 4 bedrooms, 6 bathrooms, home office and den. 3,422 interior sq.ft., 1,018 exterior sq.ft., 4,440 total sq.ft. Unit 0902 Model B - 3 bedrooms, 3 and 1/2 bathrooms. 2,703 interior sq.ft., 726 exterior sq.ft., 3,429 total sq.ft. Unit 0903 Model C-3 - 2 bedrooms, 2 and 1/2 bathroom and study. 2,103 interior sq.ft., 1,185 exterior sq.ft., 3,288 total sq.ft. Unit 0904 Model D-3 - 2 bedrooms, 2 and 1/2 bathrooms and study. 1,875 interior sq.ft., 1,572 exterior sq.ft., 3,447 total sq.ft. Unit 01001 Model A - 4 bedrooms, 6 bathrooms, home office and den. 3,422 exterior sq.ft., 1,018 exterior sq.ft., 4,440 total sq.ft. Unit 01002 Model T - 3 bedrooms, 3 and 1/2 bathrooms. 2,858 interior sq.ft., 1,227 exterior sq.ft., 4,085 total sq.ft. Unit 01003 Model U - 4 bedrooms, 4 and 1/2 bathrooms and home office. 3,591 interior sq.ft., 1,817 exterior sq.ft., 5,408 total sq.ft. Unit 01101 Model A - 4 bedrooms, 6 bathrooms, home office and den. 3,422 interior sq.ft., 1,018 exterior sq.ft., 4,440 total sq.ft. Unit 01102 Model W - 2 bedrooms, 2 and 1/2 bathrooms and den. 2,289 interior sq.ft., 1,219 exterior sq.ft., 3,508 total sq.ft. Unit 01103 Model V - 3 bedrooms, 3 and 1/2 bathrooms. 2,906 interior sq.ft., 1,727 exterior sq.ft., 4,633 total sq.ft. Unit 01201 Model A - 4 bedrooms, 6 bathrooms, home office and den. 3,422 interior sq.ft., 1,018 exterior sq.ft., 4,440 total sq.ft. Unit 01202 Model X - 4 bedrooms, 5 and 1/2 bathrooms and home office. 4,000 interior sq.ft., 2,639 exterior sq.ft., 6,639 total sq.ft. Unit 01401 Model A - 2 story, 4 bedrooms, 5 and 1/2 bathrooms, maids room and den. 4,431 interior sq.ft., 4,323 exterior sq.ft., 8.754 total sq.ft. Unit 0LPH02 Model Y - 4 bedrooms, 6 bathrooms, home office and den. 3,422 interior sq.ft., 1,018 exterior sq.ft., 4,440 total sq.ft. Unit 0LPH01 Model A - 4 bedrooms, 6 bathrooms, home office and den. 3,422 interior sq.ft., 1,018 exterior sq.ft., 4,440 total sq.ft. Unit 0MPH02 Model Z1 - 5 bedrooms, 6 and 1/2 bathrooms, study and home office. 5,315 interior sq.ft., 2,246 exterior sq.ft., 7,561 total sq.ft. Unit 0UPH01 Model Z2 - 2 story townhome, 5 bedrooms, 6 and 1/2 bathrooms, study and home office. 5,686 interior sq.ft., 3,766 exterior sq.ft., 9.452 total sq.ft. Model GS-1 - 1 bedroom, 2 bathrooms and den. 1,813 interior sq.ft., 936 exterior sq.ft., 2,749 total sq.ft. Model HS - 2 bedrooms, 3 bathrooms and den. 2,532 interior sq.ft., 781 exterior sq.ft., 3,313 total sq.ft. Model IS - 2 bedrooms, 3 bathrooms and den. 2,586 interior sq.ft., 482 exterior sq.ft., 3,068 total sq.ft. Model JS - 1 bedroom, 2 bathrooms and den. 1,838 interior sq.ft., 349 exterior sq.ft., 2,187 total sq.ft. Model FS-2 - 3 bedrooms, 3 1/2 bathrooms, family room and home office. 2,776 interior sq.ft., 409 exterior sq.ft., 3,185 total sq.ft. 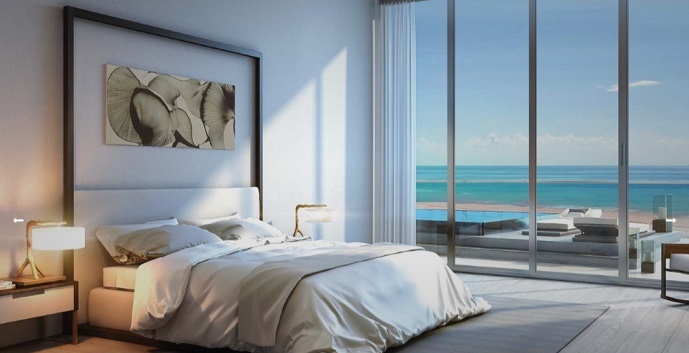 Model ES - 1 bedrooms, 2 bathrooms and den. 1,335 interior sq.ft., 276 exterior sq.ft., 1,631 total sq.ft. Model DS2 - 4 bedrooms, 4 1/2 bathrooms and family room. 3,365 interior sq.ft., 1,399 exterior sq.ft., 4,764 total sq.ft. Model CS2 - 3 bedrooms, 3 1/2 bathrooms and family room. 2,787 interior sq.ft., 1,377 exterior sq.ft., 4,164 total sq.ft. Model BS - 2 bedrooms, 3 bathrooms and den. 1,816 interior sq.ft., 360 exterior sq.ft., 2,176 total sq.ft. Model AS2 - 4 bedrooms, 5 bathrooms, family room and home office. 3,500 interior sq.ft., 1,659 exterior sq.ft., 5,159 total sq.ft. Model FS - 3 bedrooms, 3 1/2 bathrooms, family room and home office. 2,792 interior sq.ft., 489 exterior sq.ft., 3,281 total sq.ft. Model ES - 1 bedroom, 2 bathrooms and den. 1,355 interior sq.ft., 276 exterior sq.ft., 1,631 total sq.ft. Model DS - 4 bedrooms, 4 1/2 bathrooms and family room. 3,365 interior sq.ft., 599 exterior sq.ft., 3,964 total sq.ft. Model CS - 3 bedrooms, 3 1/2 bathrooms and family room. 2,787 interior sq.ft., 508 exterior sq.ft., 3,295 total sq.ft. Model AS - 4 bedrooms, 5 bathrooms, family room and home office. 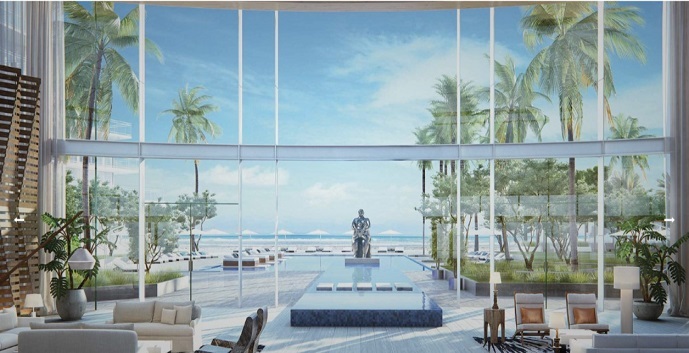 3,500 interior sq.ft., 916 exterior sq.ft., 4,416 total sq.ft. Model FS1 - 4 bedrooms, 4 1/2 bathrooms, family room and home office. 3,106 interior sq.ft., 574 exterior sq.ft., 3,680 total sq.ft. Model DS - 3 bedrooms, 3 1/2 bathrooms and family room. 3,034 interior sq.ft., 501 exterior sq.ft., 3,535 total sq.ft. Model CS - 3 bedrooms, 3 1/2 bathrooms and family. 2,787 interior sq.ft., 508 exterior sq.ft., 3,295 total sq.ft. Model KS - 4 bedrooms, 6 bathrooms, den, family room and home office. 3,676 interior sq.ft., 705 exterior sq.ft., 4,381 total sq.ft. Model LS - 3 bedrooms, 4 1/2 bathrooms, family room and home office. 3,724 interior sq.ft., 730 exterior sq.ft., 4,454 total sq.ft. Model LPH01 - 4 bedrooms, 5 bathrooms, family room and den. 3,500 interior sq.ft., 916 exterior sq.ft., 4,416 total sq.ft. Model LPH02 - 2 bedrooms, 3 bathrooms and den. 1,816 interior sq.ft., 360 exterior sq.ft., 2,176 total sq.ft. Model LPH03 - 3 bedrooms, 3 1/2 bathrooms and family room. 2,787 interior sq.ft., 508 exterior sq.ft., 3,295 total sq.ft. Model LPH04 - 4 bedrooms, 6 bathrooms, family room and home office. 4,962 interior sq.ft., 3,851 exterior sq.ft., 8,813 total sq.ft. Model MPH01 - 4 bedrooms, 5 bathrooms, family room and home office. 3,500 interior sq.ft., 916 exterior sq.ft., 4,416 total sq.ft. Model MPH02 - 2 bedrooms, 3 bathrooms and den. 1,816 interior sq.ft., 360 exterior sq.ft., 2,176 total sq.ft. Model MPH03 - 4 bedrooms, 6 bathrooms, den and home office. 5,817 interior sq.ft., 3,971 exterior sq.ft., 9,788 total sq.ft. Model UPH01 - 4 bedrooms, 4 1/2 bathrooms, den, family room and home office. 4,776 interior sq.ft., 1090 exterior sq.ft., 5,866 total sq.ft. Model UPH02 - 4 bedrooms, 5 1/2 bathrooms, family room and home office. 4,292 interior sq.ft., 4,121 exterior sq.ft., 8,413 total sq.ft. Rooftop - pool, sun room, foyer. 5,069 sq.ft.